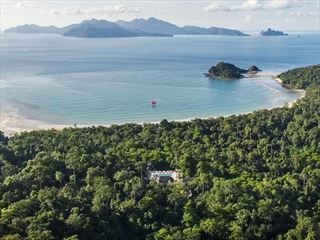 Rebak Island Resort hotel is a secluded and charming cluster of luxurious timber villas, is the only resort on the privately owned 390 acre Rebak Island that commands a magnificent view of the Senari Straits bordering the Andaman Sea. The hotel offers a choice of luxurious accommodation, dining, services and activities that makes it a perfect holiday destination and romantic seaside retreat. The island is blessed with a tropical climate, stunning rock formations, a lush forest that goes back a million years, picturesque waterfalls and fascinating caves. 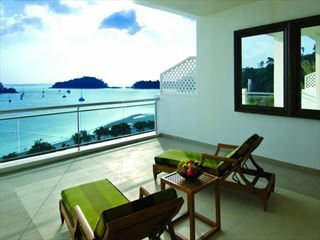 Guests arrive at Langkawi airport and drive down to Port Langkasuka (5 minutes). A 15-minute boat ride later and you are on Rebak Island. The freshly-appointed rooms and villas are designed in contemporary tones and furnished with artifacts inspired by traditional Malay arts and crafts. Some of the villas have tropical outdoor showers that enhance their charm and natural ambience. The exclusive Safa Wangi Spa offers classical Langkawi massages and therapies including naturopathy facials, nail treatments and body scrubs and wraps. All treatments are followed by a warm bath and a herbal scrub. Mangrove discovery tours with resident naturalist. Swimming Pool which includes a poolside bar. Boardwalk restaurant serves regional curries and barbeque delicacies. Senari is an all day dining restaurant which serves a wide range of Chinese, Indian and continental delicacies. SY 69 is a stylish bar and lounge with a beautiful view of the Marina and its yachts. Minum Minum is a stylish contemporary bar with live entertainment.